The sun beats down on the I-30 Canyon at Akard. Photo by Alex Macon. 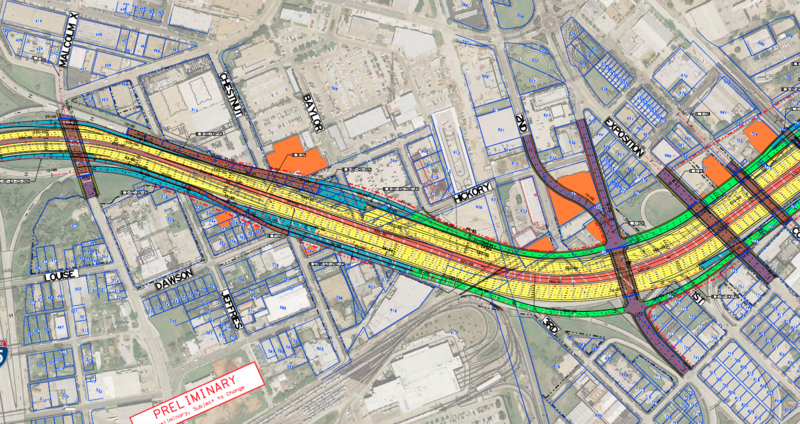 Engineers at the state transportation department have concocted a new I-30 expansion plan that would devastate downtown and East Dallas for a generation or more. You can say this about Texas’ highway engineers: they’re tenacious and relentless. Even though in 2016 TxDOT drafted CityMAP, one of the most forward-thinking transportation studies to deal with the tangle of downtown highways that have plagued Dallas’ urban core for more than half a century, engineers at the agency have designed an I-30 expansion that doubles down on the same city-destroying mistakes of the past. A draft engineering plan submitted to Dallas city staff this month for comment and review depicts a redesigned Interstate 30 that extends the road’s shelf life as a monstrous, development-killing behemoth. Perhaps as catastrophic, the plans forgo the guidance of the CityMAP study, which was the product of a painstaking period of research, analysis, and community and stakeholder input. CityMAP is a national model in how urban areas can deal with the challenge of inner-city highways in the context of neighborhood revitalization, urban connectivity, and economic development. TxDOT, with its latest draft engineering plan, tossed those lessons out the window. The added or expanded frontage roads, widened overpasses, exit ramps, and surface streets will increase the speed of traffic through the neighborhoods adjacent to the highway, which impedes CityMAP’s central goal of reconnecting the neighborhoods within the urban core, and will negatively impact potential economic development. The design expands the number of highway lanes and frontage road lanes beyond the largest options presented by CityMAP, thus doubling down on a failed and wasteful strategy of dealing with congestion by adding traffic capacity. Although the design extends a below-grade freeway through Exposition Park, the road re-surfaces at Munger Boulevard, disrupting another central goal of CityMAP to reconnect East Dallas and Samuell-Grand Park to the neighborhoods around Fair Park. The highway, frontage roads, exit ramps, and adjacent street redesigns exceed the existing footprint of I-30, requiring the seizing of property—commercial sites as well as single family homes—by eminent domain. If this newly engineered I-30 were constructed, many of the potential benefits laid out by the CityMAP study would be squandered. Which leads to the obvious question: if Dallas had in CityMAP a clear policy direction on how to redevelop I-30, how did this happen? One answer to that question is that highway engineers tend to do what highway engineers do. TxDOT spokesperson Tony Hartzel said that the schematics were drawn up to reflect what is outlined in the 2045 Metropolitan Transportation Plan, which is adopted by the Regional Transportation Council (“which has five representatives from the City of Dallas,” Hartzel reminds us). With regards to the limited stretch of below-grade highway, Hartzel said changes were made in response to drainage issues in East Dallas. But that doesn’t explain why the general design of the road exceeds the limits and design parameters set forth by CityMAP. The only answer to that question is that clear leadership and policy directive has been absent from the design process. But no one has done their homework. There have not been any public input sessions. There are no scheduled sessions with the Council. Instead, TxDOT engineers sat in a room by themselves and drew up a draft engineering plan that it has now submitted to the city to receive feedback. This is precisely the opposite of the process CityMAP intended to initiate. In fact, what made CityMAP so special—unique in the country—was that it reversed this old, top-down, engineer-driven way of transportation planning. As misguided as these designs for the I-30 redo appear, the blame can’t all be laid at the feet of the engineers. Dallas failed to take control of this project. But now Dallas has an opportunity to set things right. TxDOT has submitted these plans to city staff for comment and review. Staff should tell TxDOT, “Thanks but no thanks,” and it should begin the process over in the correct way. We know what TxDOT will say to this. TxDOT will claim that if Dallas doesn’t act now, it will lose its spot in the development line and billions of dollars in highway money will be spent elsewhere in the state. If that is the case, who cares? Spend the money elsewhere. Dallas can wait. It would be much better to delay I-30’s redevelopment by a decade than implement a design now that will ruin Dallas forever.